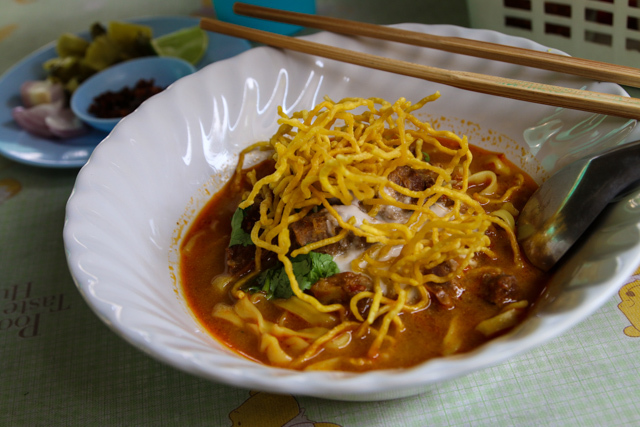 If you ever visit northern Thailand, specifically Chiang Mai or Chiang Rai, you'll undoubtedly come across a dish known as khao soi (it's also sometimes spelled khao soy). It's available at countless restaurants throughout northern Thailand, from touristy restaurants to local hole in the walls. Khao soi is a northern Thai dish composed of yellow egg noodles combined with a creamy coconut milk based curry gravy. I have to say it's almost like a Thai style stroganoff, with a few extra ingredients. Everyone makes their version a little different, but I think the most important part of any bowl, the foundation of the dish, is the curry sauce, made with coconut milk and a blend of spices and chilies. 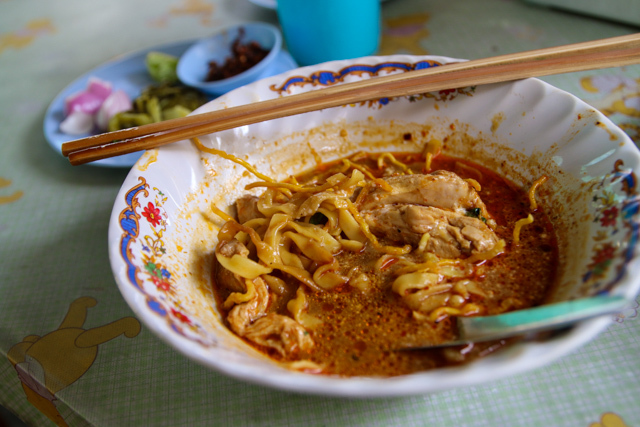 The mains types of khao soi are chicken, pork, and sometimes beef if you eat at a Thai Muslim restaurant. The dish has origins from Burmese cuisine, where there are a number of similar flavored dishes. One of the reasons I love eating in Thailand so much is because of all the amazing condiments and toppings, and khao soi is no different. Being a lover of condiments, there's no way I can eat a bowl of khao soi without dressing it up to my liking. 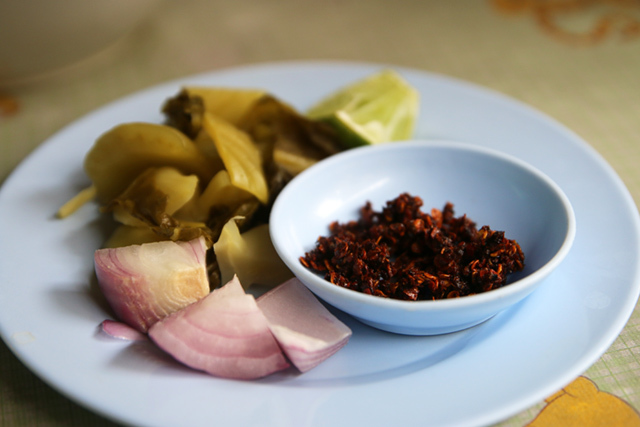 With any bowl, you'll be served some extra roasted chili flakes, which can be in dry form or more like a sauce, pickled mustard greens, and finally some pieces of chopped red onions or shallots. While it's best to taste the broth first, so you can first get a feel of the original flavor, I can say that it will just about always taste better with some more chilies in it – at least if you enjoy a little heat. Khao soi broth is creamy and rich, and depending on the particular restaurant you eat it at, it can be slightly sweet, or it can be more spicy and complex with a blend of dry spices. I prefer the latter version, more spice filled and less sweet. 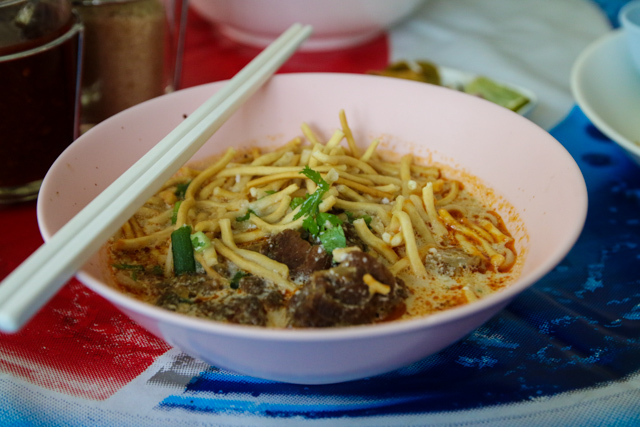 If you go Chiang Mai, probably the most famous place to eat khao soi in the entire city is a restaurant known as Samer Jai. It's actually a huge restaurant, and they serve a large variety of different northern Thai dishes, but are most famous for khao soi. For their version, the broth was a little on the sweet side, but it had a good nutty flavor to it. It was extremely rich and also had a layer of fragrant red chili oil served on top. Overall, the version at Samer Jai was alright, but not my favorite. 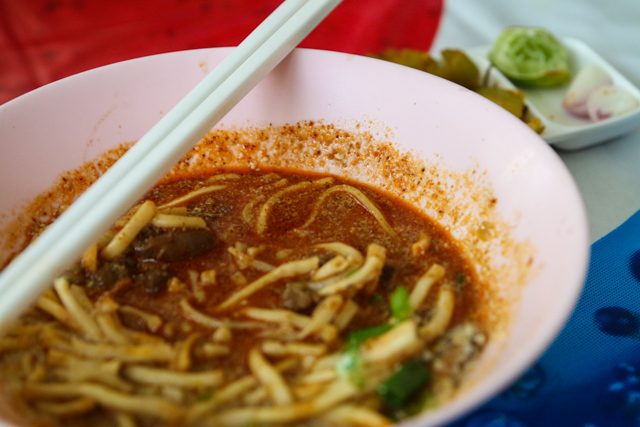 On my latest visit Chiang Mai, I decided it would be my mission to eat many bowls of khao soi and try to find the best. After trying quite a few bowls, I ate at Khao Soi Khun Yai, a small and open air restaurant where grandma does the cooking. Their khao soi emerged from the kitchen, looking spectacular even before seasoning it. The broth was dark red from the start, and before even taking my first bite, it just looked fantastic. The broth was creamy and rich, but not too oily like it can sometimes be, it wasn't nearly as sweet as other versions. The noodles were thick and hearty and flavorful. I decided to eat both the chicken and beef versions, and both were equally satisfying. 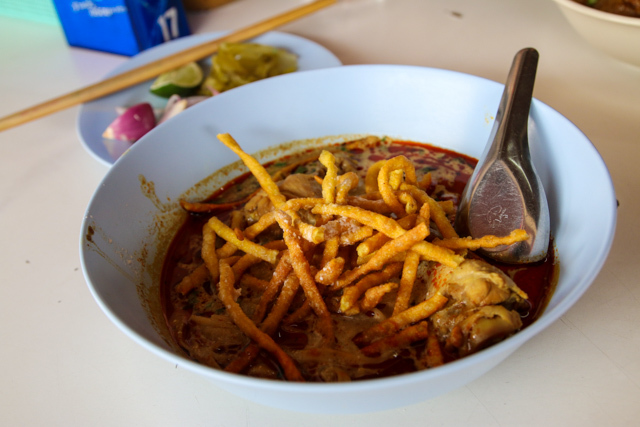 When you visit northern Thailand, among the many delicious things to eat, don't miss a good bowl of khao soi. I love Khao Soi! I eat this everyday in Chiang Mai. Thank you for writing this blog. I’m going to share it now. Hm, it looks good but i’m not such a fan of coconut milk in meals. it often has such a dominant taste. Khao Soi is excellent. One of the things I love about being in Seattle (my hometown) is that there’s a growing number of Thai restaurants here that will do Isaan cuisine. Anyone visiting here should check out Pestle Rock. Their food is legit, and addicting.